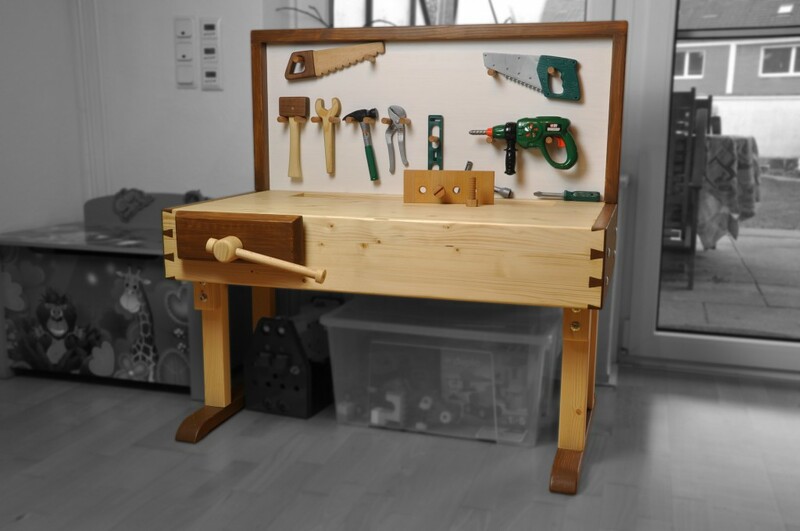 I made a small workbench for my son to play with. 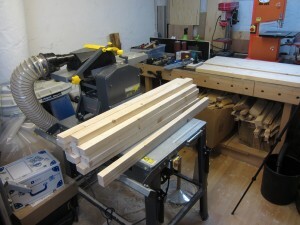 But it should also be a real workbench or potting table in the future. I made it out of construction lumber like 2x4s. 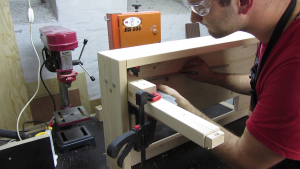 It has a functional vise made entirely out of wood, a tool well, a tool wall and height adjustable feed. First of all I had to prepare the stock. 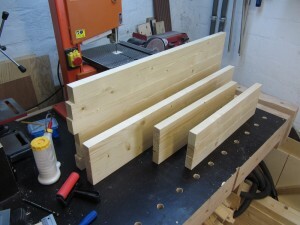 I bought the wood already cut into 1 Meter or about 3 feet pieces. I searched through the pile to find the best pieces for the legs. The other ones got some passes thought the thickness planer, jointer and tablesaw to get the right thickness and width for the workbench top. After I found the best faces I drew a triangle onto the top and front pieces so I can match the same order later. 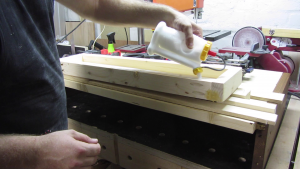 Gluing up the top was a little tricky because I wanted to have a tool well so I decided to put it together in multiple steps. At first the solid part and then part for the tool well. 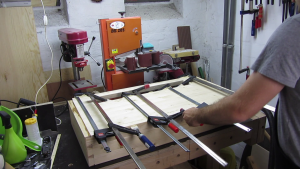 My crosscut sled is to narrow so I hat to cut the ends with my circular saw. The front and side glueup was straight forward. Three boards gave me the width I needed. 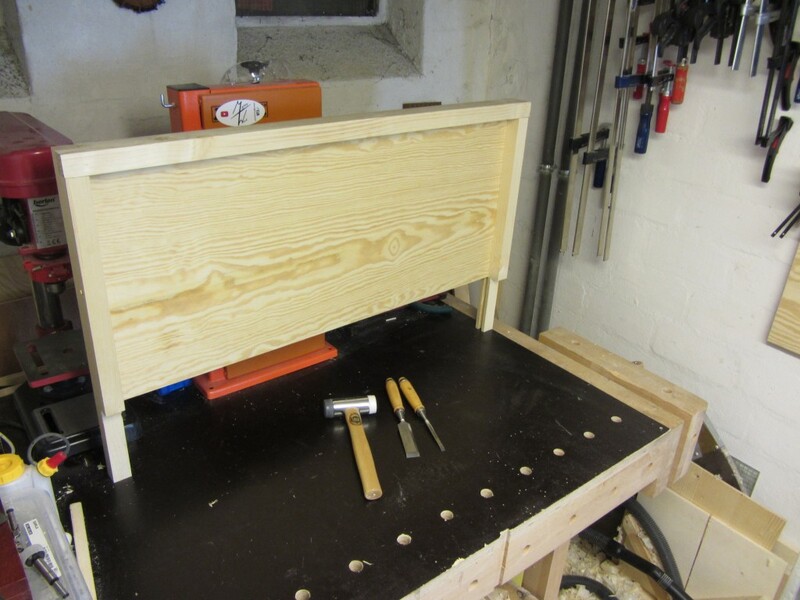 I wanted to give the front some eye catcher so I decided to join the sides and the front with some bulky dovetails. 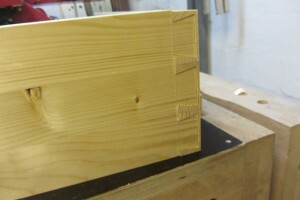 That was my first attempt to make dovetails. There are some gaps but after the glue up and staining they are only visible if you have a closer look. One thing I kept in mind was wood movement, especially pine construction lumber I may use outside will change with the seasons. Therefore I decided to glue the top to the front and just draw bore the sides to the top. 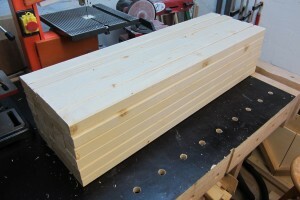 I made some tongues on the top and grooves on the sides before drilling three holes on each side. I enlongated the hole in the tongue so that the pegs I glued in later let the top move. After some round over I started the tool wall. 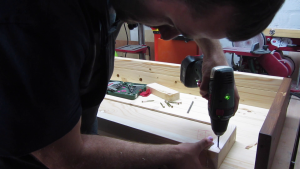 I made a frame with half lap joint to hold a plywood panel in some grooves. 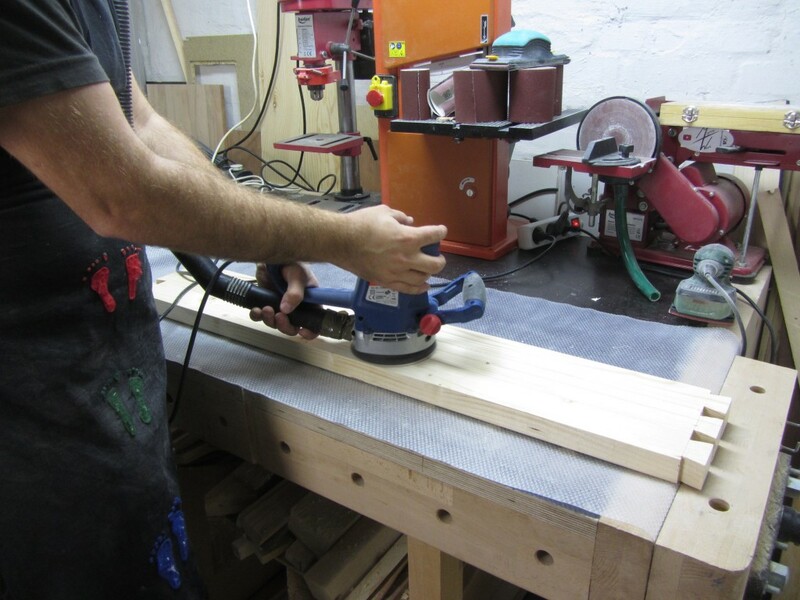 The ends got also half laps so I could screw the whole wall onto the back of the workbench top. To keep the finishing process easier I prefinished the underside of the feet and the inside of the sides. Then I could glue the dovetail joint and the pegs into the top. I wanted the workbench height adjustable so it can grow with my kid. So there are two parted legs. 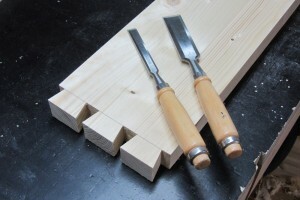 The first part are the feet and the lower legs, which are joined together with mortise and tenon. The feet got round ends for estatic and safety reasons. The upper part of the legs are bolted to the sides with carriage bolts. The upper and lower parts are also joined with two carriage bolt each leg. 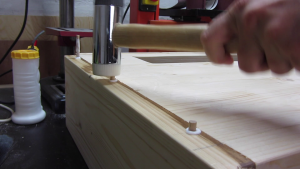 To adjust the height, there are multiple alternative holes in the lower part, which can be used to set the top higher. If this is not enough the upper leg parts can be replaced by longer ones. After squaring everything up I glued the feet to the legs with epoxy. 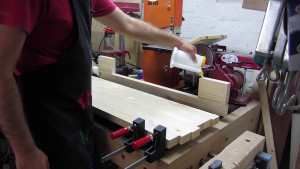 I used epoxy because the tenons were a little loose in their mortises. To keep it simple I joint the sides off the tool well with pocket holes, put a piece of pywood into grooves and glued and screwed it to the bottom of the top. 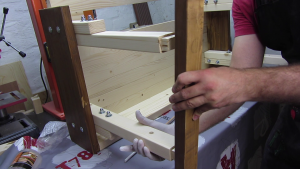 To be honest the vice is not very durable and if I really want to use it I would replace the wooden threaded rod with a metal one or at least hardwood one but for children it is better to have some week points which will break instead of injuries happen. I chamfered the edges of the jaw and soaked a dowel in boiled linseed oil. 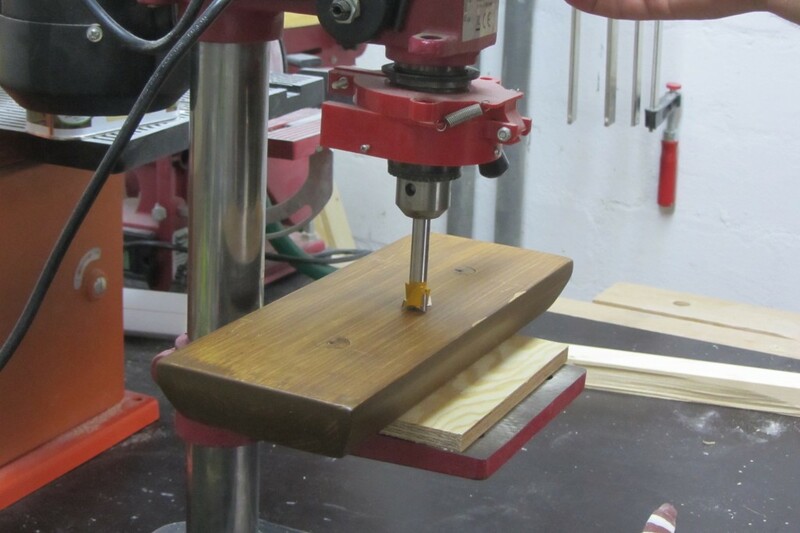 Next day I used a wooden thread cutter to create the vise screw and lubricate it with beeswax mixture. I drilled the holes for the guide rods and the vise screw with forstnerbits. Then I could tab the threads into the hole. After preparing the jaw I cut a wooden locking washer with a hole saw and attached it to the vise screw. I also made a head for the screw and mounted it on the other side of the jaw. 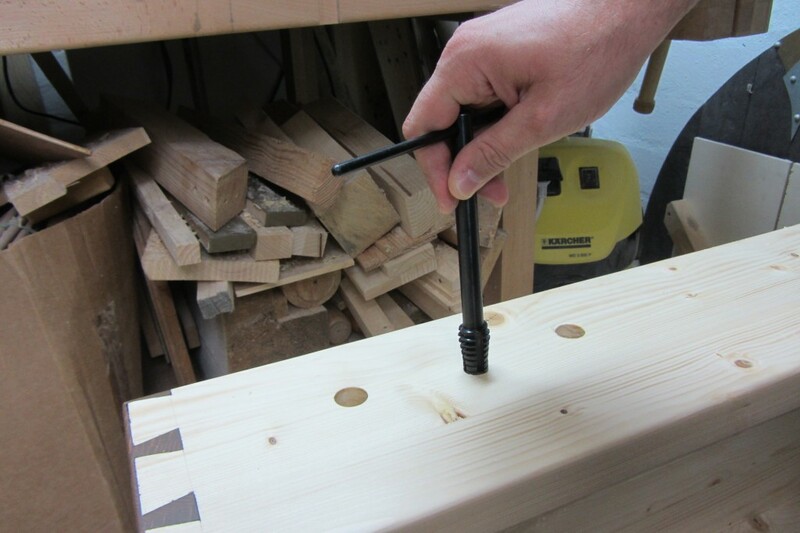 The hole in the screw head was used for a handle I also made out of a dowel. For gluing the guide rods epoxy was the right choice because the mounting recess on the jaw was a bit loose so I needed to fill some gaps. Before I put on any finish I sanded everything with 80, 120 and 240 grid. After cleaning the dust I used masking tape to prevent the dark finish leaking over to the top and front. I used Osmo Wood Wax Finish Walnut to create a contrast between the top and the sides. 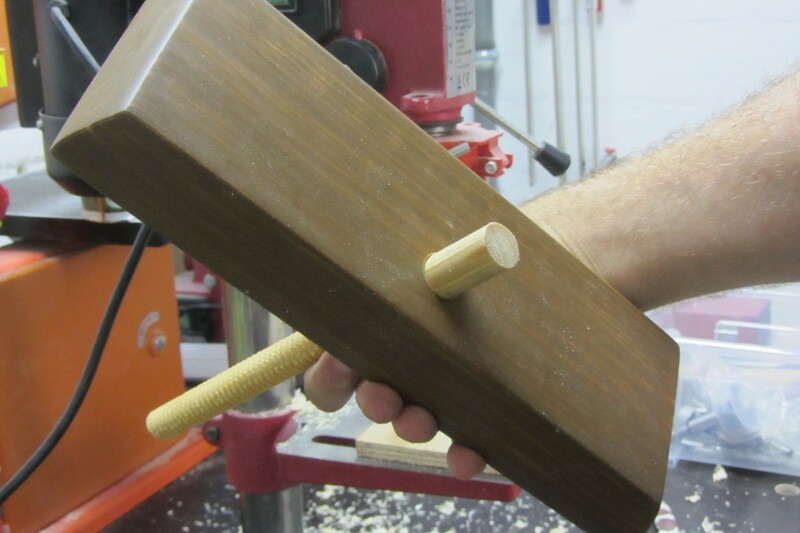 I used it on the vise jaw, side pieces, the feet and the tool wall frame. 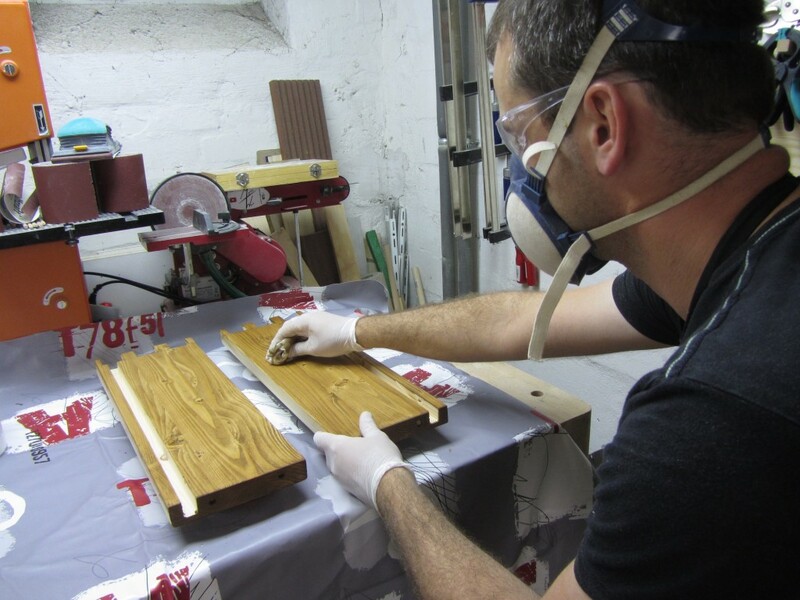 I applied one coak of this wax finish and waited until it dried. After giving it a light touch with 1000 sandpaper to knock down the dust. To seal the rest of the pieces I used Osmo Top Oil Natural. 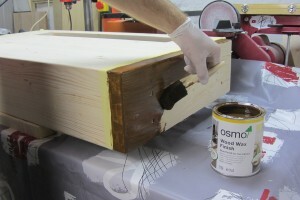 I applied two coats of this oil mixture to every piece of the workbench including the already coated dark pieces. 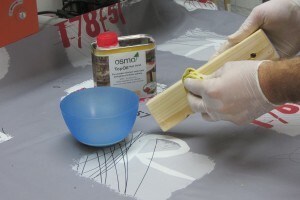 One thing that is very important for toys: All finishes I used are absolutely food safe. In the end I finished the tool wall with Osmo Wood Wax Finish White Matt and attached some short dowel as tool holder to it. Posted on October 29, 2015 by Daniel. 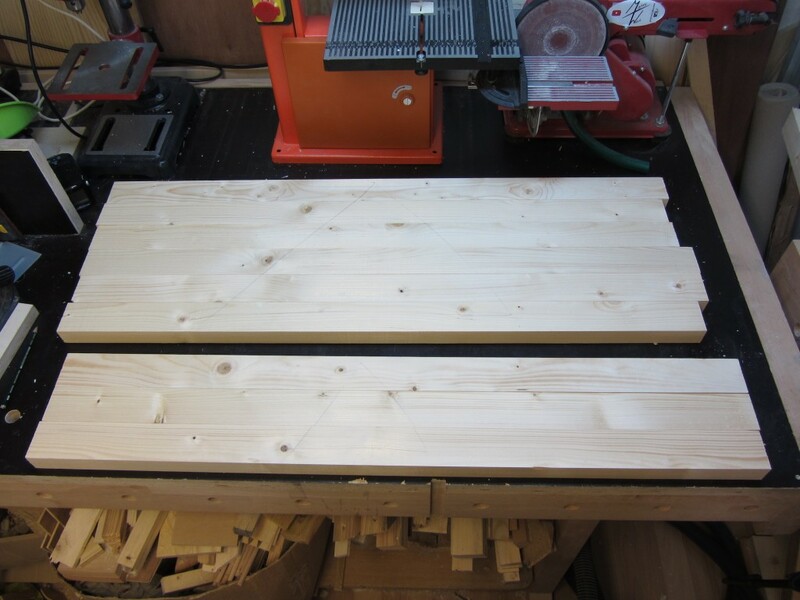 This entry was posted in Shop Improvement and tagged A Boys Workshop, Spruce, workbench. Bookmark the permalink.